“Our bodies are [our] nation and if those borders are crossed without our consent, there will be consequences," she says. When outspoken comedian-actress Margaret Cho presents her new, live stand-up show, “Fresh Off the Bloat,” this November, it will feature her usual humorous attacks on right-wing power brokers, bigots and the power hungry. This time, however, she’s angrier than ever. She'll be here Sunday at The Fillmore Philadelphia, then at Sands Bethlehem Events Center later in the month. “The title refers to the bloated nature of American politics and the excesses of Hollywood that have allowed the Harvey Weinsteins and Kevin Spaceys of the world to exist, something I have witnessed since I started in showbiz,” said Cho. Cho famously went after the last Republican administration – George W. Bush – when it came to previous stand-up tours, “Assassin” and “Revolution.” Having a President such as Donald Trump, in her mind, is an entirely different animal. “Oh my God, it’s so crazy and so embarrassing,” she said. Cho believes that the one good thing to come from Trump’s reign is that political protest and avid activism has once more come to the fore. “We can shift and change the world through our words and our actions, and that’s exciting,” she said. One woman who hasn’t benefited from her own form of protest is fellow comedian and friend Kathy Griffin. After having her photo taken with a mock-beheaded Trump, Griffin lost work and was lambasted by one-time media associates such as CNN’s Anderson Cooper, TMZ’s Harvey Levin and Bravo’s Andy Cohen. “Kathy’s always been an iconoclast – that’s her brand of comedy, her lifestyle, and she’s never changed,” said Cho, regarding her buddy Griffin, who recently released her own 17-minute put-down tape. Ask Cho whether or not her own brand of iconoclasm makes her a target of disdain, and she agrees with the possibilities. Getting by or not, Cho calls the predatory nature of men in power – from Trump to Weinstein – a real state of emergency that must be met and dealt with. “It’s all just a matter of acting naturally, with everyone being respectful of everyone,” she said before offering her opinion of the Weinsteins, Tobacks and Spaceys of the world. None of this makes Cho hesitant to work in the business, but, rather work harder to find those with whom she can work respectfully. Remember, Cho is the Korean-American who created the first Asian-based comedy (“All-American Girl”), consulted comedian-writer Eddie Huang on his own sitcom “Fresh Off the Boat,” and just landed a new dramedy series on the TNT Network, entitled “Highland." Currently in the pilot phase, “Highland” is a “Dallas”-like soap opera, only this empire of Cho’s devising involves weed in California, rather than oil in Texas. “You choose to work with people who respect you and respect the work,” said Cho. Considering her fights for accuracy in depicting Asian life and culture, and railing against the dominance of white male patriarchy, it would seem as if Cho loves a good argument. 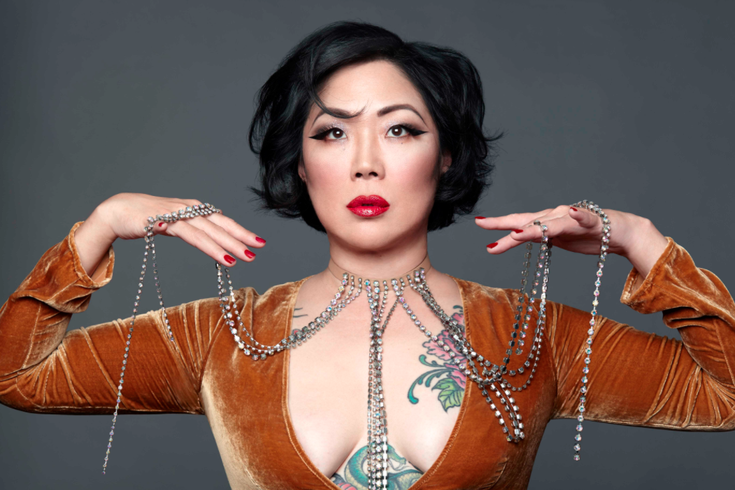 Margaret Cho appears Sunday, Nov. 5 at The Fillmore Philadelphia, 29 East Allen St. Tickets are $65-$49.50. Show time is 7:30 p.m. She'll also appear Friday. Nov. 17 at Sands Bethlehem Events Center, The Outlets at Sands Bethlehem, 77 Sands Blvd., Bethlehem, PA. Tickets are $20-$40. Show time is 8 p.m.